The railroad was part of Greensburg’s lifeblood for a long time. After all, goods had to be moved by wagon so most of the businesses had to be local. 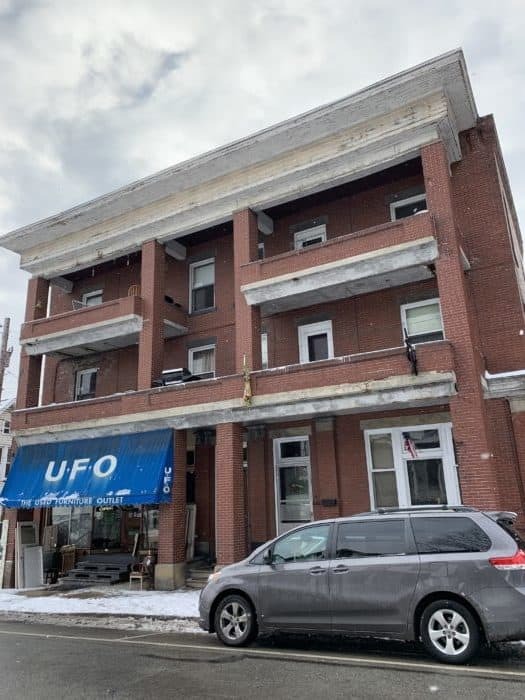 This is why it can be so interesting to discover the original uses for buildings such as the McColly building on Pennsylvania Avenue here in Greensburg. Some buildings’ previous lives are subtle and take some investigating, while others are more obvious. For example, did you know that the Greensburg post office used to be located in the building that the library is in, and the library was on Main Street? Next time you are at the current library, check out the stone facade and you’ll see “post office” etched on it. So, back to my point about buildings having hidden pasts. When I was preparing materials for my Greensburg postcard book I was scouring every antique store I could find in order to get the postcards I needed. One of the places I looked was at Some Like It Olde located in the McColly building. While I’m not sure when it was built exactly, but this building has been gracing the street for over 100 years. On the surface, the building is fairly ordinary-looking with balconies off of the second and third floors. 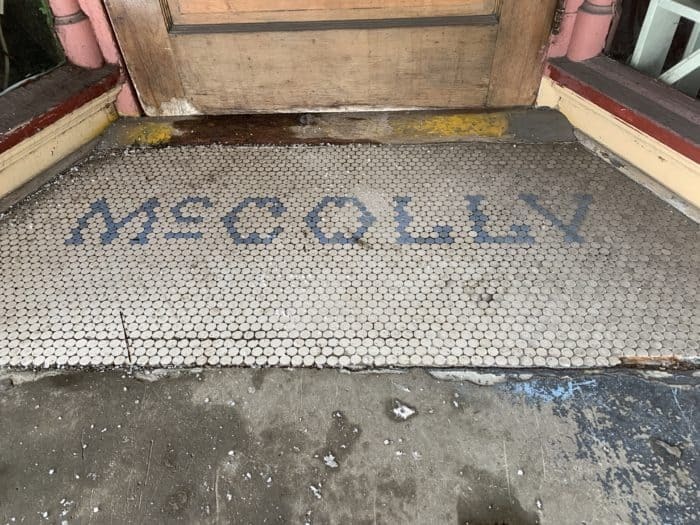 When you get to the front step in order to enter the building, you will see the name “McColly” in the tile. Nowadays the building houses a fleatique. As you admire the tin ceiling and hardwood floors you may notice something off about halfway across the room. Rails line the walls and a large, industrial hoist rests on the one side. Why on earth would a building such as this one need a hoist like that? It’s because this building was the former home of McColly Memorials — a headstone manufacturer. The McColly family had been in the granite and marble business since 1876. Originally the granite was transported from the train station using a horse and cart and brought to the Pennsylvania Avenue shop. 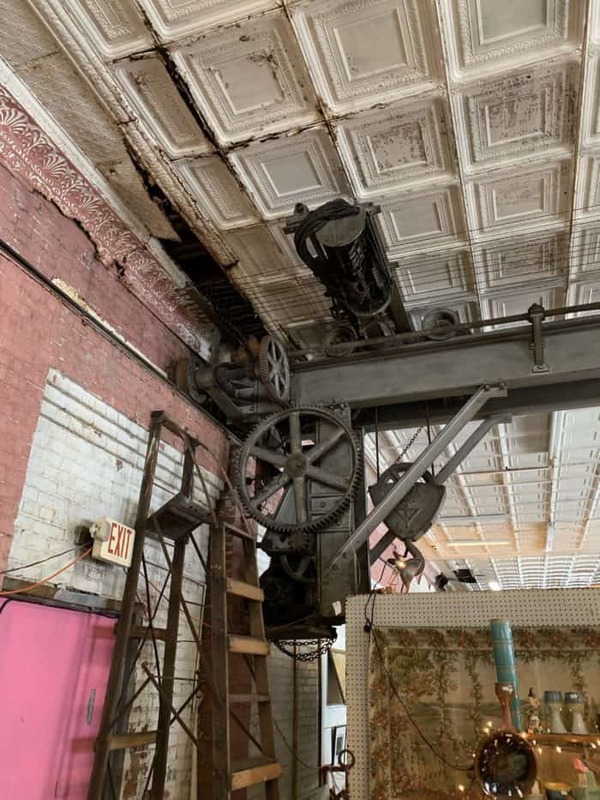 “I wonder what that was?” I heard a fellow antique hunter ask as they pointed to hoist. Since the McCollys specialized in custom memorials they were doing a lot of work with granite such as cutting, etching, and moving granite headstones. If you’ve ever felt a piece of granite you know it can be HEAVY. The hoist was used to move the slabs of granite. The McColly Memorial business moved to a new location on South Main Street. With the departure of McColly’s the building eventually became home to UFO or Used Furniture Outlet. UFO eventually expanded into the fleatique where I was standing. 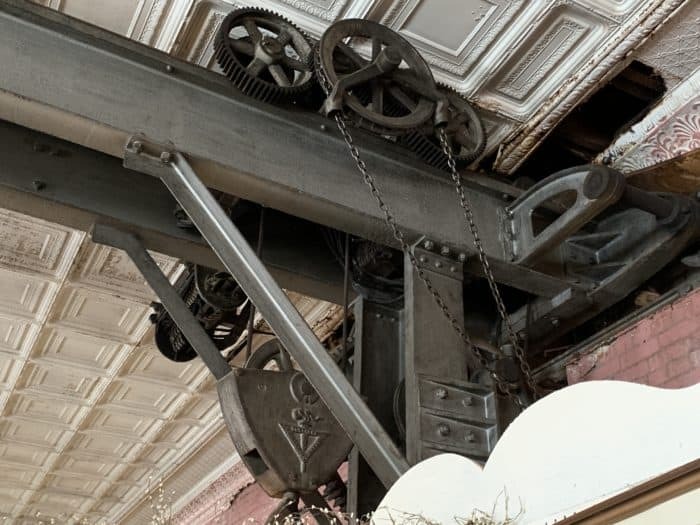 I love that the hoist was preserved since it could have easily been scrapped. 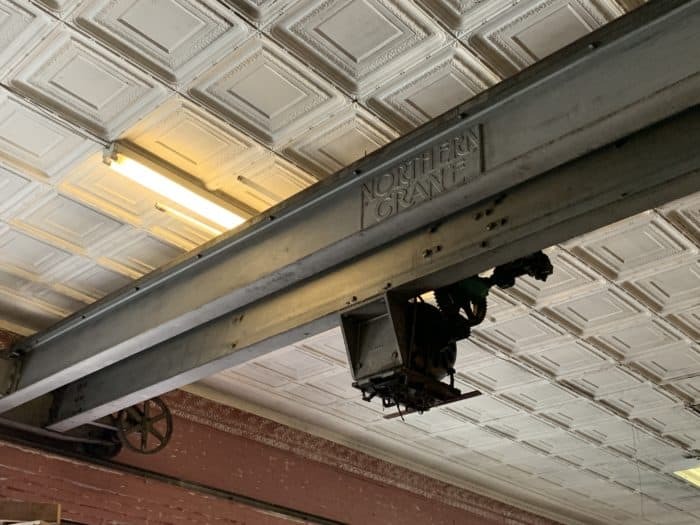 The tin ceiling was another unique feature of the building that has been preserved. If you have a few minutes, go pay a visit to Some Like It Olde in the McColley building. 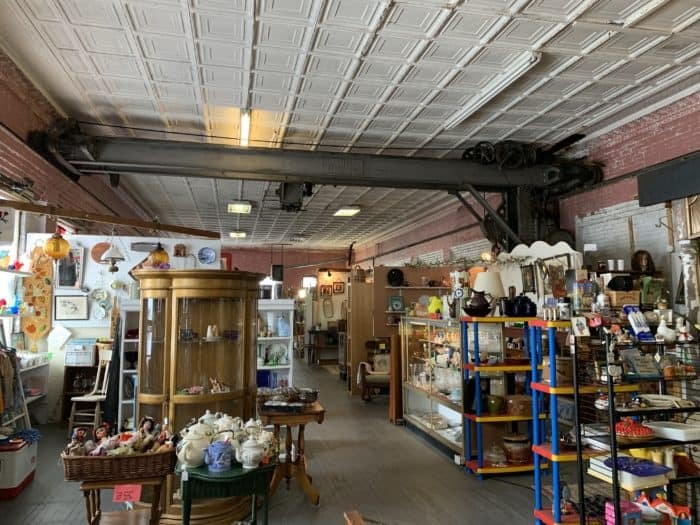 I am sure they will appreciate your business, plus you can pick up a few fun antiques while you are there!